We at EHF are delighted to see our very own Christina Kamkosi featured in Whitworth University's "Mind & Heart" newsletter! Take a look at her interview to learn a little bit more about Christina's perspective on servant leadership and on the role of relationships in working to improve the health of Eastern Washington. Christina is a Program Coordinator for the Responsive Grants and Capacity Building programs at EHF. Originally from Malawi, Christina has been part of the Spokane community since 2010. She holds a Bachelor of Arts in Mass Communication from African Bible College and an MBA in International Management from Whitworth University, and she was named one of the top 20 professionals under 40 in the Spokane region by Inland Business Catalyst Magazine in 2015. Join us on October 29 as we get a chance to deepen our understanding of end-of-life care and all it brings in a free event from 6:00 to 8:00 pm at the Spokane Convention Center. See details and download a flyer below. It may come as no surprise that there are tremendous opportunities to increase philanthropic engagement in Native communities. According to a recent report by Philanthropy Northwest, only roughly 2% of all philanthropic dollars in the Northwest US are directed to Native peoples . While at EHF we have been working with regional partners to reduce health disparities in Indian Country since 2011, we have found a unique opportunity with our Rural Aging Services Initiative, devoting approximately 22% of this initiative's funding to strengthen and build new relationships in the three tribal communities in our funding region. Shared results, community engagement, and a focus on sustainability converge to form the basis of our funding partnerships throughout Eastern Washington, and this approach, aimed at achieving full co-ownership of the work, takes on a particular shape in our efforts to serve elders living in tribal communities in the region. Currently, our Rural Aging Portfolio includes strategic projects with the Spokane, Kalispel, and Confederated Tribes of the Colville Reservation, each of which we are co-designing with our on-the-ground partners in order to meet select needs identified by each community. Of course, each of these partnerships is different, so we took on different approaches to engaging with the communities and with community leaders. However, throughout these collaborations, we have maintained a commitment to co-ownership of investments and strong community engagement with a focus on shared, measurable results. The way we see it, once we agree with our partners on what we want collectively to achieve, how we get the results we are seeking is best left to the experts – them. Like many of our initiatives, our partnership with the Spokane Tribe is a multi-pronged effort, which is aimed at improving health outcomes and reducing unnecessary emergency service use for elders living on the Reservation. While the program kicked off in May 2015, we began working with the Tribe’s Health and Human Services department in late 2014 to design a program that would meet the community’s self-identified needs and respect each partner’s priorities. Since it was the first of our tribal partnerships within our Rural Aging Services Initiative, we had no preconceived notions of what the partnership or project would look like, which meant that we needed to have at least a few in-person meetings to establish a rapport and begin a dialogue. 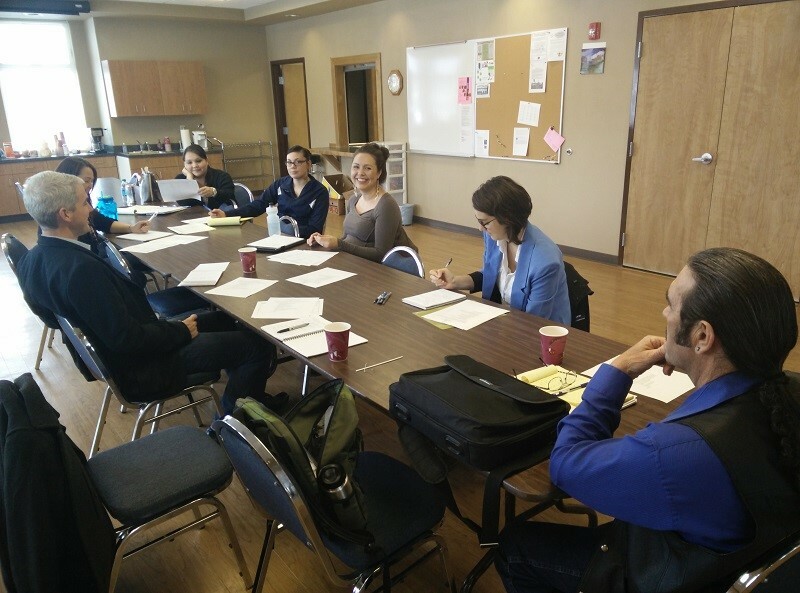 Enlisting the support of a strategic consultant, we held a preliminary design session (pictured below) with some representatives from Health and Human Services, as well some community conversations with small groups of elders. A focus on safety, a need for sustainability, staff development and providing services for elders with the highest need emerged as priorities from these early conversations. For example, one community member told the group about an elder who walked eight miles in the snow after being discharged from the hospital without somehow securing a ride back to the Reservation. Stories such as these showed us that oftentimes elders will simply make do with what they see as available, and demonstrated a need for consistent, reliable supports rather than one-off interventions. February 2015 meeting with Spokane Tribe Health & Human Services and EHF Rural Aging Team, facilitated by strategic consultant. Based on the identified priorities, we co-designed the program to include (1) in-home health coaching with locally trained community health workers, (2) monthly educational community gatherings at the Tribe’s Senior Center, and (3) minor home modifications/repairs depending on need. Through our shared commitment to seeing measurable results, we are looking to achieve a 20% increase in Patient Activation – a short-term survey-based assessment which is strongly correlated with long-term health improvements  – and a 20% reduction in emergency service use for program participants. Over the course of the two-year program, we are hoping to reach approximately 115 elders living on the Reservation. The two-year program achieved almost 25% of its enrollment target in the first three months, and we are working closely with Health and Human Services to ramp up the program and coordinate with other resources available to elders on the reservation, such as Indian Health Services and the Tribal Health Program. Fostering collaboration with other organizations on the Reservation supports sustainability efforts, and ensuring the continuation of important services for elders will go a long way towards strengthening our relationships within the Spokane Tribe community. Having developed an initial model for serving rural seniors, we started our collaboration with the Kalispel Tribe of Indians on their Rural Aging project in June 2015, and the program kicked off in early September. Based on the community health worker model mentioned above, the Kalispel Tribe’s Elder Support Program includes support for a Rural Aging Resource Specialist, who will offer in-home and phone-based health coaching support and connect elders to other services available on the Reservation, such as healthy meals, transportation, and educational events. Other program components will be developed based on community stakeholder meetings, to be administered by the Tribe, ensuring that elders’ voices are heard and incorporated into the program. As Felipe, the Tribe’s Grants Manager, wrote in the project proposal, “In Native American communities, Elders are a venerable population and regarded as the keepers of tribal culture and traditions.” For us, this means that ensuring robust community engagement is critical to building and maintaining strong relationships with this community, and we are making investments to this end with the long-term goal of supporting this partnership. In addition to direct service programs like those mentioned above, we are also making investments in partnership with the Confederated Tribes of the Colville Reservation aimed at making strategic systems improvements to better serve the community at large. We began by meeting with the Tribes’ Services Director, who stressed that while eldercare is certainly important for her community, the prerequisite for a successful initiative to improve health outcomes for elders would be an operational plan for the entire Services Division. Simply pouring in resources to start another program would miss a larger opportunity to strengthen collaboration and cohesion throughout the Division, which would have positive effects not only for elders but also for the whole community, and would moreover set the stage for a successful eldercare project later down the line. In order to address this community need, we leveraged our connection with a local strategic planner who specializes in working with Tribes, and have made a relatively modest investment that we think will go a long way toward improving health outcomes on the Colville Reservation. In short, meeting select community needs – especially supporting needed systems change – is often a key step in creating trust and building co-ownership between partners. Not only are we investing in a specific program down the line, but we are investing up-front in the relationship that makes the program possible. In sum, our approach to working with Tribes in our funding region has evolved since 2010, with the formation of our Rural Aging Services Initiative and with the new funding opportunities it created. Our commitment to shared results, community engagement, and sustainability remains, but these components take on different meaning in strengthening established partnerships and creating new relationships with Tribes. Especially in these communities, investing in results means investing in relationships, and we are starting already to see the positive effects these relationships are having on the ground. We are excited to continue these collaborations, working together to make Eastern Washington the state’s healthiest region. EHF’s Rural Aging Services Initiative kicked off in 2014, with the sole purpose of assisting seniors in rural Eastern Washington live full, meaningful lives with dignity and independence. As part of the Foundation’s efforts to improve health outcomes in our region, the program serves Adams, Ferry, Lincoln, Pend Oreille, Stevens, and Whitman Counties, as well as the Colville, Kalispel, and Spokane Indian Reservations. Philanthropy Northwest, “Lessons for Philanthropy: A Journey into Indian Country” report. See the Patient Activation Measure Research Archive for more information. With the advent of social media and such tools as Skype, WebEx, and GoToMeeting, one would imagine connecting with anyone in any setting – urban, rural, or otherwise – would be a matter of simply pressing a button and letting technology do the work. And we have found, as we round out Year 1 of Empire Health Foundation’s Rural Aging Services Program, one would be wrong. Not only is information infrastructure in rural areas less-than-robust (see map below; arrows point to some examples of partner locations), but many of the people and organizations with whom we are looking to partner might not adopt tools like those mentioned above even if the infrastructure were there. We have heard the phrase “I do/(s)he does not use email” more than once, and a good deal of senior service-related work happens ad hoc in the basements of churches and other community buildings, making home phone numbers (yes, land lines) a common piece of contact information. 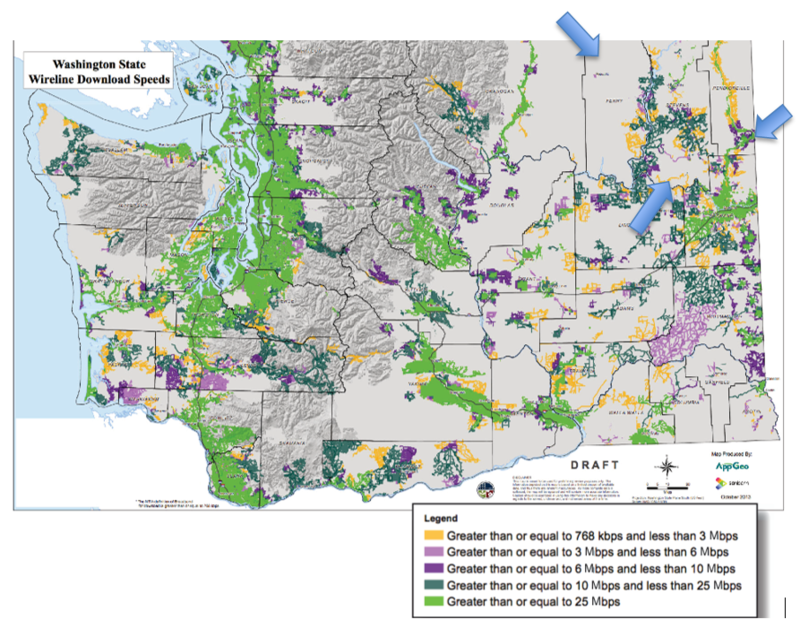 Moreover, dire straits for nonprofits in rural areas can mean that Internet is the first thing to go, or that they never acquired it in the first place. Making connections in these communities requires a couple of changes in practice and habit that go a long way toward establishing strong relationships with rural senior service partners. In-person meetings in the communities with whom we are working were the key to successful engagement in these rural towns. We quickly learned in Year 1 that rather than ask a group of potential partners – who are often the busy “wearers of many hats” in their communities – to travel hours each way for a meeting in the city, we must go to them. More than a matter of mere convenience, making the journey to a rural community is an indication of a deeper investment in our partnership with them. It says, “Yes, I am willing to spend hours in the car to see your town in action,” and “Yes, I want to get the full experience of what your community has to offer.” Many of the seniors we engage with regularly have been living in their towns for at least 50 years, if not for their whole lives. They are intimately familiar with the evolution their towns have experienced over time and with the rich histories there. Showing these folks our investment in learning about their communities, as they experience them today and as they have experienced them over the course of a lifetime, is absolutely essential to building a strong partnership. Sometimes a technology solution can actually become a barrier to communication with rural partners. During our recent application cycle, board members from a senior center in Newport, WA – the seat of Pend Oreille County, located some 47 miles northeast of Spokane – emailed us in regard to our online application system, which they were trying to access from their home computers. “Unfortunately, Hospitality House has only a very old computer and no internet,” they informed us. “We are attempting to complete this grant application on a notebook and a home PC.” Unreliable Internet connectivity made applying online quite burdensome for them, so we sent along an editable document for them to complete off-line and email back for me to transcribe into the online system. While this situation was unique, it serves as another indicator of our investment in potential partners. Being willing to change our approach, especially if it is a bit of extra time commitment, shows that we value their contributions as expressions of a community voice that we might not otherwise have heard. This note made it to us only after an email introduction via another EHF staff member, several rounds of phone tag between the rural aging team and the partner, and three consultations and revisions of the proposal. Without demonstrated commitment to building our connections with the communities we are working with, we would not have this sort of insight. The key to working with senior-oriented partners in rural areas is demonstrating an investment in your relationship with them. Time, patience, and attention to the various community voices that arise – in whatever medium – are critical to building strong relationships with any partner, but all the more so, we’ve found, when working to serve seniors in rural areas.